Melaleuca oil, also known as Tea Tree oil, is truly nature's natural antiseptic. This topical oil, which comes from an Australian tree called the Tea Tree, is naturally safe oil that is effective as an antibiotic, anti-viral, and fungicide. Tea Tree oil was first used by the Bundjalung Aborigines living in the Northeast Corner of what is now New South Wales, Australia. They would pick the oil-covered leaves of the Tea Tree and rub them on their skin to alleviate cuts, bites, burns, and other skin ailments. They made a dressing for wounds by grinding the leaves into a paste. They also crushed the leaves to use as an insect repellent. There are several kinds of tea trees. 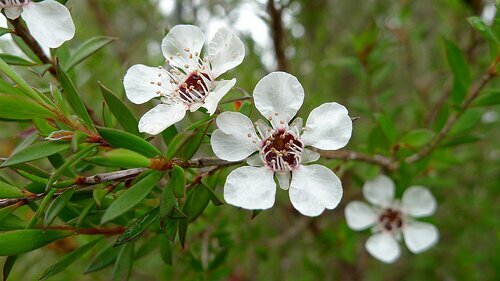 Yet, the most potent medicinal oil is called Melaleuca alternifolia. Dr. A. R. Penfold, a chemist in Sydney, found that Tea Tree oil was 13 times stronger in killing bacteria than carbolic acid, the universal standard antiseptic in the early 1900s. The Medical Journal of Australia published a study that Tea Tree oil was effective in treating pus filled infections of the skin and infected nail beds, and helped speed recovery from sore throats when the oil was gargled. Another study published in the Medical Journal of Australia in 1990 found Tea Tree oil as effective in treating acne as benzoyl peroxide, with fewer side effects. It is also effective in treating burns, thrush, and bacterial and fungal infections. Tea Tree oil can also be used for animals: bites, cuts, stings, rashes, dermatitis, lice, mange, ringworm, fleas, and ticks are just a few of its veterinary uses. Melaleuca oil may be applied full strength or diluted in water or other type of oil like olive oil. Most Tea Tree oil that is produced is added to skin and Beauty care products, such as deodorants, shampoos, and mouthwashes. Industrial-grade oils are used as disinfectants, floor detergents, and can be added to air conditioning and ventilation systems to kill mold and fungus. As we rediscover nature's natural medicines through modern research, a new world of therapies is opened to us. Natural therapies are often as effective as drugs, but without the side effects. Many medicinal drugs contain properties to heal that no synthetic drug has been able to mimic.